Christmas is not just Peace, Joy and Happy hearts … it is also nice food and sweets. Accept this as a good thing. Abandon all worries about overeating and gaining weight. Instead: Be smart, prepare and stay in shape. 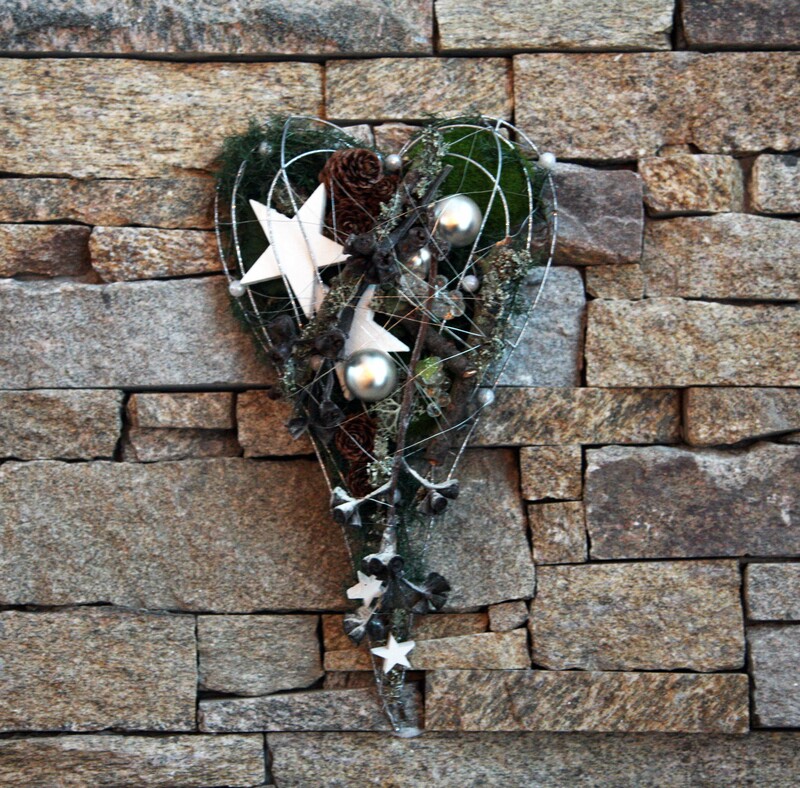 A green Christmas Heart on the fireplace. Per Braendgaard Myth calendar 20/24 (quote): Myth: It is not what you eat between Christmas and New Years Eve, that makes you gain weight. It is what you eat, between New Years Eve and Christmas! So you might as well eat like crazy in December and then diet in January. Fact: What you eat between Christmas and New Years Eve can also make you gain weight, so you might as well be on (the right healthy) diet in December, not just January. 1. Initiate your Christmas meal with a drink of water (or just before the meal); Water is healthy and you won’t feel as hungry. 3. Eat slowly, so the great taste lasts much longer, mmmmmhhhhhhhh. 4. Have small portions – you can have two servings if needed (avoid wasting food). 5. Start with vegetables (and avoid white bread, which makes you hungry); high fiber foods makes you feel full and healthy – and you won’t overeat the less healthy stuff. 6. Enjoy your Christmas dinner(s), every bite of it, it’s only Christmas once a year. But ensure that your food is of good quality and savour it; mindful eating. 7. Make the right choices. If you are surrounded by candy, then choose wisely: Go for 2 home-made pralines with dark chocolate and marzipan, it is filling and satisfying, rather than 20 mass-produced pieces of sweets … think strategically. 8. Move more (as much as possible); walk the dog, the family or the trash. Even small amounts of movement count, e.g. after your meal, it is good for you and your digestion. 9. Be physically active during Christmas, this is a good time; you have time for it. Take a trip to the countryside or the seaside and go for a walk; it is wellness with a touch of fat burning … a little is a lot better than nothing. And: Work out, there are plenty of ways of working out properly between Christmas and New Years Eve. Do you own outdoor (or home) fitness program or go the fitness center, which offers exciting group exercise classes. It is also a brilliant time to kick off a new exercise habit (instead of January, when everyone else has the same idea). Proper exercise is an effective means of weight maintenance during Christmas. 10. Think wisely. Apart from positive thinking in general it is a smart move to tell yourself: “I will never go on a diet and most certainly not in January” (a diet is an almost foolproof method of gaining weight over time). When you pass on that option, you will take better care of yourself during Christmas and the rest of the year. A moment of truth: Any risk of uncontrolled over-eating; the big irresistable Christmas dinner (or buffet)? Then an option could be to neutralize the effect by having a day or two of fasting, e.g. the day before and/or after – or the intermediate solution of 12 hours of fasting (in the fast (5:2) diet; 1 small meal is allowed). Not just to save calories; but you get to know your body and appetite better, which is great. Note: Do not skip eating two days in a row, as it results in muscle protein breakdown, and you do not want to lose muscle mass: The muscles are more metabolically active than fat! In the fast diet you eat like you normally do for 5 days and fast (partially) for 2 days (not consecutive). In IF, Intermittent Fasting, you eat one day and go one day without eating. Note, there are different IF strategies. In these types of diets you retain lean mass, ie muscle, which is not seen with standard calorie restricted diets.